New for May 2014! Contributed by Bryant. Mixed-mode S-parameters are used for the analysis of differential circuits, and provide the capability of analyzing the signal flow through differential/balanced lines. S-parameters were originally developed to analyze single-ended/unbalanced networks. But why limit ourselves to describing single-ended networks? We can adapt these single-ended S-parameters to describe differential networks to report differential and common modes of operation which are commonly known as mixed-mode S-parameters[ref1, ref2]. The following paragraphs will describe the conversion of single-ended S-parameters to mixed-mode S-parameters and uses a 3-port network as an example. Let’s imagine some 3-terminal differential device to be measured on a VNA like the one shown in figure 1. Terminal A represents the single-ended/unbalanced port and terminals B and C represent the differential/balanced port. When the DUT is tested on the Vector Network Analyzer (VNA), it is measured in a 50 ohm environment, and typically recorded in some form or another where the single-ended data is reported. This single-ended data can then be manipulated mathematically to report the mixed-mode scattering parameters. The nomenclature used to represent the three different modes is represented by d – differential, c – common, and s – single-ended. 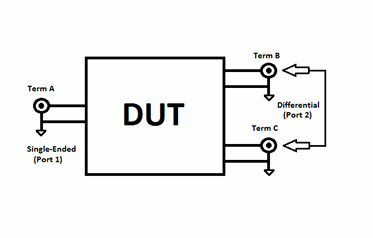 We can then use mixed-mode S-parameters to determine the single-ended/unbalanced input return loss, differential/balanced output return loss, differential-mode insertion loss, common-mode rejection ratio (CMRR), magnitude imbalance, and phase imbalance. The input reflection coefficient on the single-ended/unbalanced port is represented as S11ss and is equal to single-ended S11 results returned by the VNA. The differential/balanced output reflection coefficient can be represented as S22dd, and can be calculated using the single-ended S-parameter data using the equation below. The input and output VSWR can be determined from the reflection coefficients in the normal fashion and is covered in more detail on our VSWR page). Similarly, we can take -20 log of that linear magnitude to determine the return loss in decibels. Check out our return loss page here. The differential-mode insertion loss of the device can be represented as Sds21 and found from the single-ended S-parameters using the equation below. Similarly the common-mode response can be derived from the single-ended S-parameters using the following equation. The differential-mode and common-mode responses are typically expressed in decibels and can be found by taking 20 log of the linear magnitude value. The common-mode rejection ratio is a key figure of merit of any differential system because its primary role is to reject undesired common-mode currents with minimal impact on the desired differential-mode currents. It is defined as the ratio of powers of the differential gain to the common-mode gain found in equations (2) and (3). The imbalance is also an important figure of merit when describing the performance of a differential circuit. As the name suggests, the imbalance is the measurable difference between the two single-ended balanced ports (Terminal B and Terminal C), and is typically reported in both magnitude and phase. At lower frequencies this inequality is typically negligible; however as the frequency is increased any offset in lead inductance will degrade the imbalance. The imbalance can be calculated using the single-ended S-parameters from the following equation.